How much is a Custom Men’s Wedding Ring? When you announce that you are getting married, a lot of importance gets put on the bridal rings. After all, you’re going to be wearing those particular pieces of jewelry every day for years to come, so why not get a ring that fits your personality rather than just a plain band? At Valeria Fine Jewelry, we make it easy to have a Custom Men’s Wedding Ring created just for you that will be unlike a ring anyone else has. For years the only wedding ring that mattered was the brides, but now men’s wedding bands are coming into their own. Men’s wedding rings should be just as important as the engagement ring that seals the deal, and just like all jewelry, men’s ring styles change with the times. We are acutely aware of this and are always abreast of current trends in Custom Men’s Wedding Ring designs. The two strands in this Men’s Rope Wedding Ring represent the unification of two people for life. It is shown with at 4mm wide, but it can be made wider. The rope could also be changed to add strands if you wanted it to represent more than 2 people. This Unisex 2 tone wedding ring is cast in 2 pieces and then soldered together to form a beautifully melded ring of white and yellow Gold. We flush and bezel set black and white diamonds to give it even more contrast. Click the image to see a finished ring! Men’s wedding bands have evolved significantly from the traditional simple gold band worn by your grandfather. Choosing or creating a wedding band unique to the groom has become a hot thing. There are many new ways to customize using different metal combinations, textures, and gemstones. Creating a Custom Men’s Wedding Ring allows the groom to select flashiness, restraint, or a little bit of both! This 2 tone mud bogger wedding ring was created with the tread of a client’s ATV. He was also a Chevrolet freak, so we added a white gold Chevy symbol and set some diamonds in it. True 2 tone rings have each piece cast in their respective metals and are then soldered together. The vast majority of 2 tone rings at the mall have been plated, which isn’t permanent. If you are a male and getting married, you might be wondering how much a custom Custom Men’s Wedding Ring costs after seeing the boring rings at the mall? If you’re considering having a Custom Men’s Wedding Ring created, you’re probably also wondering how it’s different from your typical wedding ring shopping experience. Aside from the obvious difference between a mass-produced wedding ring and one that is created especially for you, the primary difference is cost. This Unique Custom Men’s Wedding Ring has armored plates (or Spanish roof tiles!) going around the ring in between two rows of diamonds. There is a rope inlaid on the sides of the ring rails as well. This diamond wedding ring was 10mm wide and had 2mm stones, but it could me made narrower and with other size stones. This Channel Set Men’s Wedding Ring is a simple beveled band with 3 vertically channel set stones. It has a brushed finish, but it could be given any type of polish that you wanted. This Custom Men’s Wedding Ring was 6mm wide, but it can be made as narrow as 4mm wide and up to 12mm wide. Many jewelry stores claim to make “Custom Jewelry” but they actually just customize; changing the details of an existing design or adding some engraving. True Custom Men’s Wedding Ring designs are created from scratch specifically for that person. A custom ring starts with an idea or an image that the customer might have. 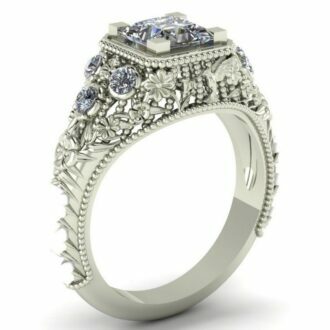 Then, your ring is designed in a CAD program and manufactured one piece at a time. The cost of a Custom Men’s Wedding Ring reflects this. But keep in mind that each Custom Men’s Wedding Ring is an original; a personal combination of cost of the customer’s style and personality, which should command a premium. This is one of our unisex wedding rings. By lowering 2 opposite section of the band, we were to give it a crossover appearance We made one for groom at 6mm wide and one for the bride at 4mm wide. Both were given a hammered finish. Our Mythosaur Star Wars Wedding Bands have an enamel Mythosaur flanked by channel set stones. We can make this Star Wars Men’s Wedding Ring design with any of the emblems or logos form that galaxy far, far away as long as it will fit on the ring. The Mythosaur is made with enamel, which is far more permanent than the oxidation. It is only damaged by heat and solvents like acetone. Custom Men’s Wedding Ring Cost: $175 – ??? The main cost driver for a Custom Men’s Wedding Ring is whether or not you want diamonds in it. Adding diamonds to a Custom Men’s Wedding Ring can significantly add to the cost, depending on the number and quality of stones. There are less expensive options that cam mimic the look of diamonds though such as Moissanite, CZ, and White Sapphire. The second largest portion of the cost of a Custom Men’s Wedding Ring is the metal. On the low-end is Sterling Silver, which costs a fraction of the cost of Platinum or Palladium Custom Men’s Wedding Ring designs. We made a his and hers version of this Biker Wedding Band. We gave the band a stone finish to make the biker stand out. The we added diamonds to make the bike pop. This is the hers version. 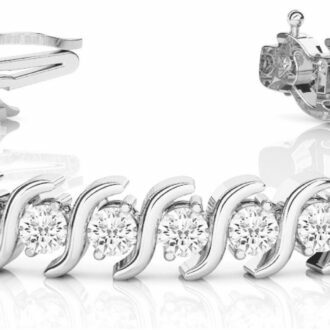 One way that many lower the cost of Custom Men’s Wedding Ring designs is to use diamonds from family heirloom jewelry. Your Custom Men’s Wedding Ring can be designed around your existing stones, potentially lowering the overall cost of a custom ring dramatically. It is also possible to reuse the metal from old rings not worn anymore. This can also reduce the price substantially. 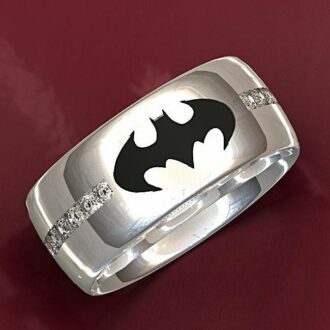 This is our most popular batman wedding band design. We can make them as narrow as 5mm and as wide as you want them. The stones can be almost anything and any number of them can be put on each side of the bat. Or they can go all the way around. Diamonds aren’t the only gemstone that can be recycled and we’ve designed rings around family sapphires, emeralds, and rubies that also helped to lower the cost. Our Talladega Tire Tread Wedding Ring is prefect for your man wanting a tire tread wedding ring with some sparkle. This one has two rows of 1.5-stones on each rail outside of the tread. We can customize this ring in any way that works for you and check out our other tire tread and mud bogger wedding rings. Lab grown gemstones are a great option for our clients who want the look of real stones, but without the pricetag. We have created hundreds of Custom Men’s Wedding Ring designs using colored stones and they are a great option for adding color or to show the birthstone of a loved one. This is one of our favorite Skull Wedding Band Designs designs. It is 8mm wide and has 6 skulls and 3mm Black Diamonds alternating around it. It can be made as narrow as 6mm and as wide as you wanted it to be. Almost any stone can be used and in the wider width, stones could be added to the eyes. Different skulls can also be used as well. Custom Men’s Wedding Ring: Is Custom Right For You? Each person has different priorities in terms of how they budget their money; some spend more in areas where others spend less. There are countless options for Men’s Wedding Rings, some less expensive than others. A Custom Men’s Wedding Ring isn’t for everyone, and if you want a plain white gold band, then get it! But if you want something a little more personal, then contact us and we will see what we can do for you. This grooved wedding ring is basically a plain band that had small triangular sections removed at even intervals. But we think it is pretty cool anyways! We could make the notches wider or narrower. It is also possible to make the notches a different shape if you aren’t feeling the triangle shapes. We are not the click-and-buy internet jewelry store even if you want an existing design that we just need to cast and finish out. All of our Men’s Wedding Ring designs are made to order and can take 2 weeks minimum for even the simplest ring to be completed. We’re also not the cheapest option and you might be able to find something similar made in Asia for less. But because we are custom jewelry designers we will do our best to design a Custom Men’s Wedding Ring around your budget. And have pride that you are supporting custom jewelers in the US. Are you looking for a Confederate Flag Wedding Ring but can’t find a one anywhere? They don’t have enough popular appeal to be mass-produced and sold by the chain stores. And in today’s politically correct craziness, many custom designers would pass on this idea, but we didn’t! If you want it, we will create it! We even made a matching pendant for our customer to wear with his Rebel Flag Wedding Ring. Do you who find it appealing to have something made one-of-a-kind? Just for you? And barely replicated? Then a Custom Men’s Wedding Ring is for you. We also offer the option of never remaking your ring again if you want it to be truly one of a kind. Do you value design and want a ring that’s a work of art? A custom Men’s Wedding Ring is for you. Do you want a durable ring manufactured with precision and designed to be in your family for future generations? A custom Men’s Wedding Ring is for you. Do you have family heirloom jewelry you want to remodel into a new, sentimental Men’s Wedding Ring? Then a Custom Men’s Wedding Ring is for you. We had a client who wanted a ring made from Cortana’s suit and so our this is what we came up with. We don’t judge! Whatever your idea may be for a Custom Men’s Wedding Ring, we would love to create it. Custom Men’s Wedding Ring – Give Us a Try! We know there are a ton of places selling wedding rings. There are also quite a few offering to create custom wedding rings. Valeria Fine Jewelry stands a few notches above most of these places. If given the chance, our expertise, service, and value will be immediately evident once we begin working on your Custom Men’s Wedding Ring. This men’s wedding diamond ring has 4 rows of pave diamonds. However, we could go down to as few as two rows if that is what you want. The sides of the ring are decorated with a rope. It is shown with 1.3mm stones, but larger stones could be used. Click HERE to see our complete portfolio of Custom Men’s Wedding Ring designs. Click HERE to lean more about custom jewelry, to view our the rest of our custom jewelry creations, or to contact us about custom wedding bands for men. It can cost less than you think to have your very own custom wedding ring made. Why settle for boring, uninspiring, mass-produced bridal rings from the mall? We can make exactly what you want. Don’t see what you are envisioning in our portfolio? Send us the design you want and we will bring it to life. It is that simple.